Urban cyclists, rejoice: New York City is transforming 225 parking meters into bike racks. Every third or fourth parking meter on select streets in the Upper East and West sides, Brooklyn, the Bronx, and Queens will have its “head” chopped off and recycled for scrap metal. The remaining poles will be transformed into bike racks. 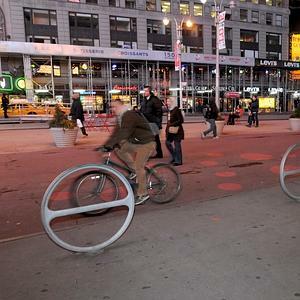 The circular racks can hold two to three bikes each, and they aren’t cheap–each one costs $300. But the city is ultimately saving $200 on each rack by reusing the meter poles instead of installing new bike parking structures. And the move is sure to please the more than 130,000 cyclists that traverse NYC streets every day. In case you were wondering, the plan won’t mean more free parking for drivers. The torn-up parking meters will be replaced by communal meters at the end of each block.